NOTICE: Activation key must be used on a valid Steam account. Requires an internet connection. Deluxe Edition Yooka-Laylee Digital Deluxe is the ultimate platforming package, including an exclusive digital manual and art book, plus the games incredible soundtrack! Yooka-Laylee’s mouth-watering (ear-leaking?) soundtrack combines three of gaming’s greatest composers, the … legendary David Wise (Donkey Kong Country, Diddy Kong Racing), equally esteemed Banjo-Kazooie composer Grant Kirkhope (Viva Piñata, GoldenEye 007) and the award-winning Steve Burke (Kameo: Elements of Power). This is one musical performance you definitely don’t want to miss! Yooka-Laylee’s 24-page digital manual and art book features exclusive details on the characters, worlds and challenges set to feature in the highly-anticipated platformer revival! Oh, and there are a few excellent puns in there too, if you’re interested. The digital artbook includes never-before-seen concept art and in-development images offering an insight into the creation of the game. Marvel at the post-it note origins of serpent salesman Trowzer! Say ‘wow’ as you discover that Dr. Quack used to ride a tank! A must-have for fans. About the game Yooka-Laylee is an all-new open-world platformer from genre veterans Playtonic! 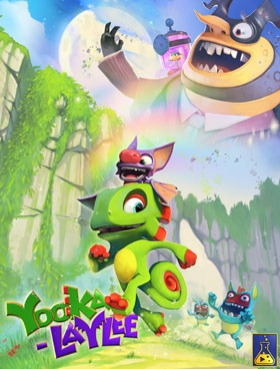 Explore huge, beautiful worlds, meet (and beat) an unforgettable cast of characters and horde a vault-load of shiny collectibles as buddy-duo Yooka (the green one) and Laylee (the wisecracking bat with the big nose) embark on an epic adventure to thwart corporate creep Capital B and his devious scheme to absorb all the world’s books… and convert them into pure profit! Using their arsenal of special moves, our heroes will tackle a huge variety of puzzles and platforming challenges in their search for Pagies, the golden bounty used to unlock — and expand — stunning new worlds, each jammed to the gills with oddball characters, hulking bosses, minecart challenges, arcade games, quiz shows, multiplayer games… and much more! Key Features INTRODUCING OUR NEW BUDDY DUO Yooka and Laylee boast an awesome arsenal of abilities built for platforming fun and unlocked with added freedom from the serpent salesman Trowzer. CARVE YOUR OWN PATH Purchase and unlock moves with freedom, choose to expand your favourite worlds into even larger, more complex playgrounds and equip unique Tonic gameplay modifiers to customise your play style. Every player will have a unique experience. A COLLECT-EM-UP FOR THE MODERN ERA Seek out a roster of shiny collectibles with gameplay progression at their core (as well as other, more valuable materials), such as the dual action Butterfly Energy or tricky Ghost Writers! A CAST TO LAST Meet (or beat) a huge cast of memorable characters brought to life by the art and audio teams behind legendary platform games, and destined to endure in future adventures as part of Playtonic Universe. Expect all manner of grunts, squeaks and squawks. A DREAM SOUNDTRACK David Wise (Donkey Kong Country) and Grant Kirkhope (Banjo-Kazooie) combine for a melodic masterpiece! Seriously, clean out your ears – they’re in for a treat. BUDDY UP Establish your own buddy-duo and adventure through Yooka-Laylee in co-op mode! Taking control of a unique co-op character, a second player can assist Yooka and Laylee by stunning enemies and helping them tackle tricky challenges. No piggyback required. AND A WHOLE LOT MORE Discover unique boss fights, mine cart challenges, retro-tastic Arcade games, quiz shows and more than 8 unique multiplayer games! System Requirements Windows - Minimum OS : Windows 7 (64bit) Processor : Intel i5-2500 3.3GHz Memory : 8 GB RAM Hard Drive : 9 GB available space Graphics : NVidia GTS450 / AMD Radeon 6850HD Sound card : Windows Compatible Card DirectX : Version 11 Additional notes : These specifications will be updated as testing continues. Mac - Minimum OS : OSX 10.9.5 or higher Processor : Intel i5 @ 2.7GHz Memory : 8 GB RAM Hard Drive : 9 GB available space Graphics : GeForce 640M or equivalent Additional notes : These specifications will be updated as testing continues. Steam OS + Linux - Minimum OS : Ubuntu 14.04 or later or SteamOS Processor : Intel i5-2500 3.3GHz Memory : 8 GB RAM Hard Drive : 9 GB available space Graphics : NVidia GTS450 / AMD Radeon 6850HD Additional notes : These specifications will be updated as testing continues. © Yooka-Laylee. Developed by Playtonic Games. © 2017. Published by Team 17. Team17 are trademarks or registered trademarks of Team17 Digital Limited. All other trademarks, copyrights and logos are property of their respective owners.